This Friday some of the Beauty Bloggers of Central Florida are linking up with some Purple themed posts. We decided on Purple for the month of May for Lupus Awareness. For my look I decided to got with some elegant v-gap moons in some of my favorite A England shades. I started with a base of Kleancolor Chunky Holo Purple. This glitter is a sheer purple jelly base packed with tiny shifting glitters. The shift is mainly from purple, to pink to copper. I only did this to give some interest to the nakey part of the nails. The Keancolor glitter is mainly meant to be layered, but it still looked really pretty peeking under my holographic beauties. Then I added a coat of INM Northern Lights to aid in the dry time of the Keancolor glitter. I used single chevron nail vinyls to create my v-gap look. On my Pinkie and Index nail I used A England Fonteyn. This is a marvelous shade of intense silver holographic. For my Purple shade I used A England Lady of the Lake, which is a beautiful, regal, shade of Purple with a subtle holographic effect. 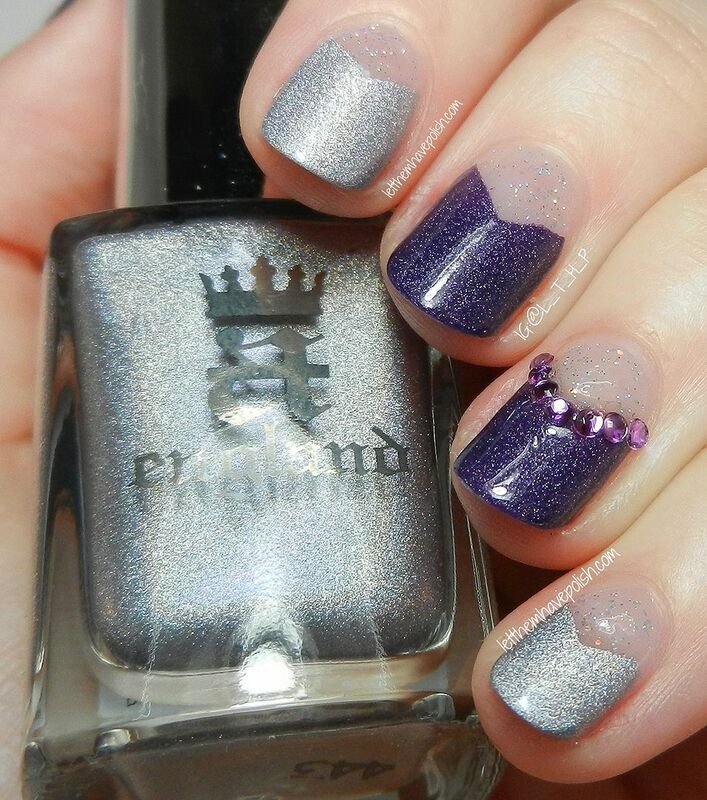 I accented my Ring nail with tiny light purple gemstones and sealed it all off with some Cult Nails Wicked Fast top coat. Thanks for coming by today and happy Friday! You have the best nails ever! I love this design and the colors! This is pretty. Wonderful manicure to show awareness and support. Oh noes ahaha. A England always puts out some of the most amazing polishes. The ballerina collection holos are unlike any others I have. They are insanely beautiful. Loooove these colors! Especially digging the holo effect. I love the colors the colors! Definitely going to have to look into them. This is super cute and elegant! You're nails are always perfect, so that's no surprise! Really love your nail art! I've been reading your blog regularly for over a year and I'm so honored that you've done a lupus awareness manicure because I suffer from it and I appreciate the well wishes! This would look so f'd up on my nails. You rock the moons, honey!